The leader of Somalia's Islamic fighters on Friday called on all Somalis to wage holy war against Ethiopia, a day after Ethiopian troops rolled into Somalia to protect the weak U.N.-backed government the Islamic group has challenged for power. Sheik Hassan Dahir Aweys, in a radio broadcast, said Ethiopia deployed troops to the government's base in Baidoa, 150 miles northwest of Mogadishu, to bolster what he described as a puppet regime. He said President Abdullahi Yusuf, his longtime rival, has "been a servant of Ethiopia for a long time." "I am calling on the Somali people to wage a holy war against Ethiopians in Baidoa," Aweys, who the U.S. government says has ties to al Qaeda, said on Radio Shabelle. "They came to protect a government which they set up to advance their interests." The Islamic group organized anti-Ethiopian demonstrations in the capital Friday, and militiamen shot dead two people who joined a daring counter-demonstration against Islamic rule. Residents of Baidoa reported seeing hundreds of Ethiopian troops, in uniform and in marked armored vehicles, entering Baidoa on Thursday and taking up positions around President Yusuf's compound. Ethiopian and Somali government officials have denied Ethiopian troops are in the country, though witnesses from five towns have reported seeing them. Reliance on Ethiopia appears to make the government beholden to the country's traditional enemy and hurts its legitimacy. Anti-Ethiopia sentiment still runs high in much of this almost entirely Muslim country, which is why the government and Ethiopia, a mostly Christian nation, may want to keep the troop deployment quiet. The neighboring countries are traditional enemies, although Somalia's president has asked Ethiopia for its support. Demonstrators in Mogadishu shouted anti-Ethiopian and anti-U.S. slogans as they marched in the capital, accompanied by dozens of Islamic militiamen and trucks mounted with heavy weapons. Radical Islamic militia later shot dead two people when a rare demonstration broke out against the rulers of Mogadishu. "We don't want Islamic movements!" shouted the protesters before they were dispersed by fatal gunfire, the Banabir radio station reported. Residents of Baidoa appeared unfazed by the presence of Ethiopian troops. Tensions sparked by fears of attacks by Islamic militants eased Friday in the town. Ethiopia's move could give the internationally recognized Somali government its only chance of curbing the Islamic militia's increasing power. But the incursion could also be just the pretext the militiamen, who control the capital and most of the rest of southern Somalia and have been accused of terrorist links, need to build public support for a guerrilla war. If the competition for power should become violent, there is little doubt that Ethiopia has the superior fighting force. Ethiopia sent troops into Somalia in 1993 and 1996 to quash Islamic militants attempting to establish a religious government. The United States on Thursday urged Ethiopia to exercise restraint and said the European Union, the United States, the African Union, the Arab League and others in an international contact group on Somalia will meet soon to consider the volatile situation. U.N. Secretary General Kofi Annan expressed concerns about the increased tensions near Baidoa and urged dialogue, according to a U.N. statement Thursday. Somalia has been without an effective central government since warlords toppled dictator Mohamed Siad Barre in 1991 and then turned on each other, carving much of the country into armed camps ruled by violence and clan law. The interim government has been weakened by internal rivalries and is distrusted by some Somalis because it includes warlords linked to past violence and instability. The Islamic group portrays itself as a new force capable of bringing order and unity. On Wednesday, the Islamic militia reached within 20 miles of Baidoa, prompting the government to go on high alert. 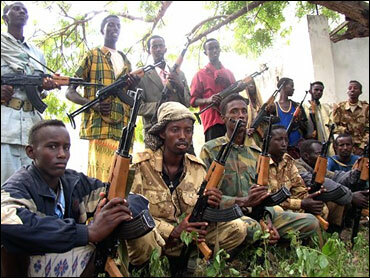 The militia began pulling back Thursday as more than 400 Ethiopian troops entered Baidoa. The United States has accused the Supreme Islamic Courts Council of links to al Qaeda that include sheltering suspects in the deadly 1998 bombings of U.S. embassies in Kenya and Tanzania. In a recent Internet posting, al Qaeda leader Osama bin Laden urged Somalis to support the militants and warned nations not to send troops here. The Islamic militia has installed strict religious courts, sparking fears it will become a Taliban-style regime.